1. The cotton fabric is made as thin as paper, with the drawing silk on its two sides, smooth, fine, neat and pretty just like the combing human hair. It is priority obviously to cotton fluffers made by other manufacturers. 2. Automatically feeding: Only scatter cotton evenly on the feed curtain, and the cotton will be taken forward and in. By this way, it can prevent operators from contacting the cotton roller directly and operators can be far away from the cotton roller so as to ensure their safety and no injuries occur. 3. Multifunctional fine cotton fluffer: This machine has nine courses of lickers-in, and can comb such materials as cotton, silk floss, chemical, knitting wool, PP cotton, wool, camel’s hair, etc. 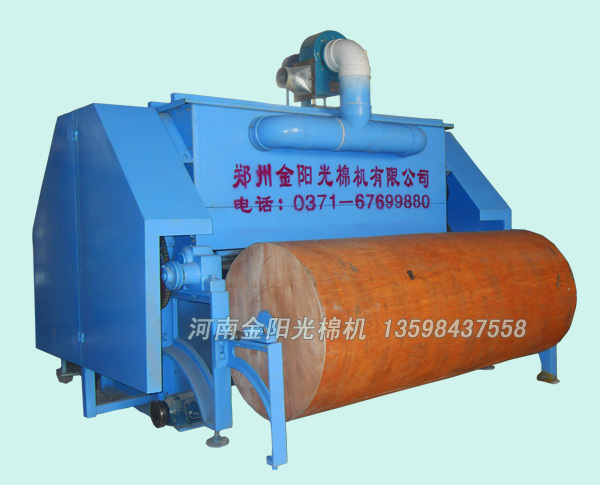 After combed by the machine through nine courses of lickers-in and stripped by the cutting die, the material is rolled up to the wooden barrel as the quilt protype with good elasticity and strong tension. This machine is mainly used for screenless cotton protypes which are used for synthetic fiber comforter, embroidered quilt, nine-hole quilt, etc. 4. Dust sucking and sound de-dusting: This machine is totally enclosed with steel plates, and equipped with the multi-blade low-noise dusk sucking fan. So, it can operate in the non-dust and environment-friendly condition, which improves the operators’ working environment and health. 5. Its frame material: The complete machine is forged with the molten steel at thickness of 30mm, and no deformation and endurable in use. 7. Area save: This machine is compact and only takes up less area. It can be installed in the ordinary civilian buildings.